I thought of retitling this post, the film where Naomi Klein meets Ernst Rohm and discovers she quite likes him. In the end the simple film triumphs as a descriptive title and yet the point of the latter is important because it describes the message of this film to a tee. Fight Club is about two men. Edward Norton plays the narrator, a corporate slave who works in an office and is bombarded with the inane verbosity of pompous business language every day. He lives in an Ikea outfitted appartment, consumes his cafe latte at Starbucks and jets around the US examining car accidents. 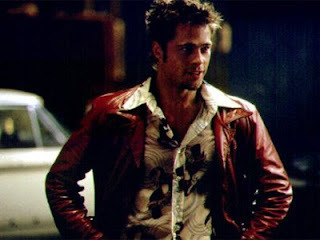 He meets on a flight his alter ego Tyler Durden who he discovers is a parttime everything. The narrators besetting disease insomnia until now has only been dealt with by attending endless therapy classes for diseases he doesn't have, with Tyler however he discovers a new passion, fighting. During the therapy sessions, he met a fellow disaster tourist Marla. The film considers the relationship of these three characters and their relationship to a third entity: together Tyler and the narrator turn their fights into a way of life, they begin fight club. Fight club is a place where men who feel emasculated during the day come together to fight after hours, its also a place where they plan random acts of terrorism- blowing up banks where credit card records are held, beating up the chief of police etc. Some saw the inspiration for this as lying in a backlash against feminism- and there is something male about what the film describes and analyses. Actually I think the film is less about feminism- women are ignored more than they are described and the principal female character is as unhappy as all of the male characters- as it is about consumerism. Rather than associate the film with American beauty, we should associate it with Naomi Klein. The argument of the film is that consumer goods have rendered us unpersons- as Tyler tells the narrator, you are what you consume, you are not you. The film's argument revolves around the antithesis between civilisation and barbarism- the latter is authentic, the former inauthentic. The narrator's condition is a condition of late capitalism: he is a drone, working in an office all day on a job which is, to all intensive purposes, meaningless. The only meaning that work acquires in any of the character's lives is as a way of mocking authority- the most fulfilling experience is to piss in the mushroom soup at an important resturant. This is the blame of the big guy taken to its extreme. The consequence of that is the development of a barbaric form of excess which allows characters to find fulfilment. Characters in the film find fulfilment in absorbing the grief of others (though even this has a fake societal edge to it), in committing suicide or in uniting to fight each other. The existential longing for meaning, for a life beyond consumer products, for no logo, ends up in fighting other people: rejection of Starbucks and embrace of blood are two halves of the same coin. Fight club takes on a life of its own swiftly and its rejection of consumerism becomes deeper and deeper, culminating in the most powerful anti-capitalist act- terrorism. The club becomes a neo-fascist organisation, rejecting the market, embracing violence, rejecting intelligence and discussion and democracy, embracing community and dictatorship. To enter the club requires endurance and denial of the self, to participate in modern society requires selfishness and flabbiness. The film has an atmosphere and is well put together. The performances from Edward Norton, Brad Pitt and Helena Bonham Carter are all good and interesting- but its the point that reverbrates in your mind after you have seen it rather than anything else. The storyline does develop into silliness by the end but there are some fine directorial moments as well throughout the film. I'm not sure if the point of the film is ultimately to criticise anti-consumerism or to embrace it- I'm not sure that the film does have a positive point at all. What I take from it though is a conumdrum more than a point, the conumdrum is how we create lives of meaning within a consumer society without relapsing into barbarism. Its a conumdrum that is very old, going back at least to the eighteenth century if not before. The alternatives on the one side might seem unhealthy- consumerism leaves a person drained of that which makes them interesting- but the alternatives on the other, the radical individualism of revolution and community of totalitarian organisation are worse. Fight Club proposes no answers and fumbles a lot of the time- some of the violence is not really neccessary, the philosophical treatises are a bit Adrian Mole for my liking- but sometimes it gets the questions right. Perhaps to truly appreciate this film though, you need to feel two things- you need to feel disillusioned and you need to feel that fighting gives you a rush. My real problem with the film is that I don't feel either particularly. I don't see consumerism as a great thing- but I do feel that there are ways of living in our world which don't have to involve it. I definitely don't see fighting as something to be rejoiced in and so I don't get the rush that Norton and Pitt's characters get throughout the film. As I cannot understand the film emotionally it remained for me a distant experience- despite the blood and guts, I felt apart from the film and never really absorbed into its world. Perhaps that is a failure on my part, but perhaps it is also a failure on the film's part: ultimately there may not be more to think about this film than that it is a cry of despair from a teenager, the world isn't fair! Tough it isn't, but fighting isn't going to help. Not much to add to this - great - review of the film, but I think it's important that the final image is Tyler and Marla hand in hand. I've always taken that as Tyler rejecting nihilistic individualism and re-entering society (on more of his own terms).